Nanotechnology based polish with colour pigments and wax particles which cleans, polishes and waxes all coloured and metallic paint surfaces in one step. Sonax Colour Polish will fill small scratches and surface damage to protect your paintwork against corrosion. This product produces a brilliant high gloss which provides long lasting protection due to its nano-sized wax particles. 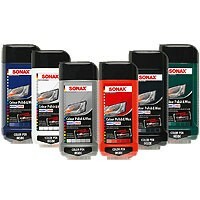 The Sonax Colour Pen in the base of the product covers deep stone chips and scratches such as key marks. This is also suitable for all painted metal and plastic surfaces. For restoration of paintwork in poor condition or suffering the effects of high mileage and sun damage, this product is welcome news. Its high technology base is way more sophisticated than previously available products and is sure to be a hit with car dealers and private individuals selling their car who wish it to look the best possible. Available in the following colours: red, black, blue, green, silver and white. Select the closest colour to your paintwork if it is not listed. Each product bottle shows the shades it will cover which vary from light to dark e.g. blue. 500ml of product should cover an average sized car approx. 6 times.